Blue Frontier teamed up with Go! Southampton to bring our marketing expertise to members of the local Southampton Business Improvement District (BID). Our first workshop was held on the 18th of January at the Coffee Lab Bargate, providing an opportunity for us to meet and greet some BID members, network and share some insight on all things digital marketing! A not for profit organisation, funded through a levy collected from businesses in the local area, Go! Southampton delivers additional services to businesses and makes improvements to the city centre. Southampton BID started out in April 2017 to serve the city which is now home to over 250,000 residents and 33,000 employees. Across the UK there are over 300 BIDs in operation, including Winchester, Bournemouth, Salisbury and Chichester. September saw Blue Frontier open in Southampton, and as such, we were keen to help local businesses get to grips with improving their online presence. We were contacted by Go! Southampton to see if we would be interested in putting on some specialist digital marketing workshops for their BID members, which we saw as a great opportunity to network with local businesses. Our first workshop was all about meeting some of the Go! Southampton members and getting to know them and their businesses. Mike Bunn, our Digital Director, led the talk on how to manage your digital space on the web, what you can do to get more traffic to your website and he also gave out some hints and tips to boost your online marketing. With so many free online resources, it provided us with the chance to raise awareness of the tools out there to help our new neighbours improve their rankings. The early morning session saw 23 attendees arrive for the workshop and complimentary coffee, from a range of well-known local businesses, all eager to boost their knowledge of digital marketing and to understand how it can help their business grow. From a Blue Frontier perspective, the takeaways from the workshop were that the Go! Southampton members were eager to learn more about marketing and that they were very receptive to the ideas raised and discussed during the session. Our aim is for the workshops to be driven by the needs of the Go! Digital members, in order to make the time as valuable as possible for those who attend. The workshops are both constructive and informative in order to help local businesses grasp a better understanding of what digital marketing is and how it can help them develop. It also provided those who came to network with the opportunity to speak to Blue Frontier about their questions and inform us of what other topics they would like to be covered in future sessions. We got some great feedback from the event with lots of information to take away and digest - and of course, we are always on hand to answer marketing questions and provide guidance. As we are always looking to improve, the feedback and input from those in attendance was greatly appreciated! Blue Frontier will be hosting more free marketing workshops for Go! Southampton members over the coming months. The next session will be on the 22nd of February and further details will be supplied as soon as possible. Based on feedback from those who came to the workshop, we will prioritise the next digital marketing topic to tackle. It is great to be able to tailor the information based on the audience and what they think will have the greatest impact on their business. The Coffee Lab was fab! Coffee Lab turned out to be a great location for the early morning start with attendees (and hosts!) supplied with lovely hot drinks ready to start the day. It was a brilliant space to host the workshop in, conveniently located at the heart of town. We can’t recommend Coffee Lab enough - the event was well catered, organised and the staff were great too. If you get the chance, go and check it out! If you are a BID member and you are interested in attending our free workshops we would love to hear from you. You can also learn more about Go! Southampton here. We couldn’t have asked for a better start to our marketing workshops, especially with the help from Go! Southampton, so we have to say a big thank you to them! We look forward to building our relationship with them even further and working together on the upcoming digital marketing workshops. 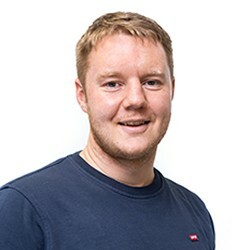 James joined the Blue Frontier Digital Marketing team as a Content Writer in December 2018. Graduating with a degree in English and History, he has since obtained experience in digital marketing from the logistics industry. He is now developing a deeper knowledge of SEO and utilising his writing skills to help businesses improve their online visibility.